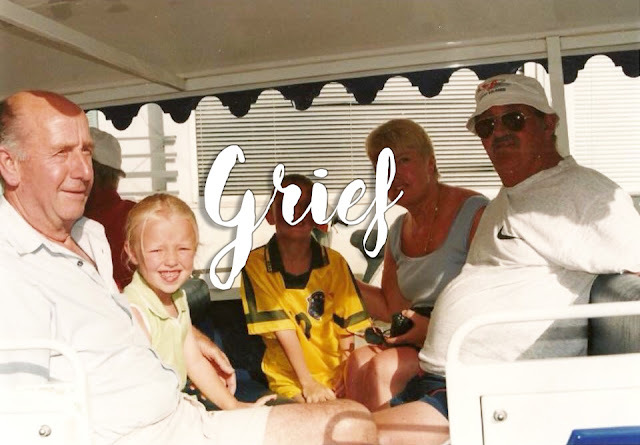 Of course grief is a lifelong emotion; when somebody dies, I don't think you ever get to the point where you just aren't sad about it anymore. What I find the strangest about grief, or my own personal grief, is its ability to transport you right back to that moment. My granddad passed away when I was about 8 years old. I was old enough to know what death meant; to know I should feel sad and to know that I would never see my granddad again. But I think as an 8 year old, I still didn't fully know how to process it. I remember being at my other granddad's birthday party, having fun with my cousins and family. My auntie took me aside and told me that my granddad had died. I cried, of course, and the first person I wanted to see was my older brother. He'd already been told and wanted to be alone. I felt crushed and confused. After that, I found it very difficult to even talk about my granddad. Every memory of him made me bawl because as the days, months and years passed, it became so much more real that a big character in my life was also one that I would never have the chance to see again. It was a family tradition that every year, on his anniversary, we would go out for a meal to celebrate his life. I dreaded that day every single year because I couldn't listen to my family giving a toast in his name, talking about memories with him... Every time we remembered him, I remembered he was gone. I wasn't allowed to attend his funeral. I assume it was because I was quite young, but looking back now, I do think it was unfair of my parents to make that decision for me. Funerals are sad but I feel it is the only closure I could have had in regards to his death, as I wasn't there when he passed, nor did I know he was sick the last time I saw him. How could I have known to say goodbye, or tell him I loved him? I am getting emotional just writing this post. I find that whenever November rolls around and it gets closer to his anniversary, I feel myself regressing in years, right back to when I was 8 years old. I woke up on 8th November this year with tears in my eyes. I felt like a baby. I wanted my mum. I wanted my granddad. I wanted to not feel such overwhelming grief 13 years later. We deal with it and process it in our day-to-day lives. I think about my granddad all the time but I don't allow myself to be sad every day. I can look at a picture of him and smile and remember. But one day I hope that I will be able to share my own memories of him around the dinner table; laugh when my mum compares my dad to his father; think about him in the quiet moments of my day; all without feeling like I am a child that cannot comprehend the fact that someone dear to me was taken from my life too soon and I didn't have any prior warning to say goodbye.